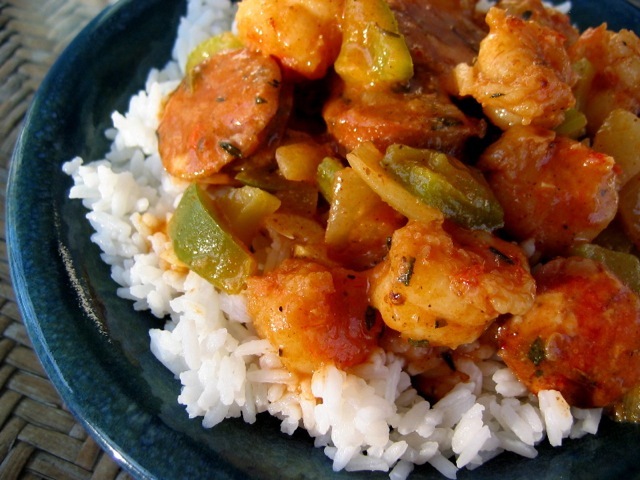 This traditional Louisiana dish tastes best with scoops of white rice. Toss the shrimp or crawfish with the paprika, 1 teaspoon of thyme, salt, ground black pepper, basil, and ground red pepper. Set aside. In a large, flat-bottomed pot or skillet, stir the vegetable oil and flour together over medium heat. Cook, stirring constantly, until the roux is almost as dark as milk chocolate, about 20 minutes. Add the chopped onions, celery, red and green bell peppers, and andouille sausage or smoked ham. Cook, stirring, until the vegetables are golden brown, 5 to 6 minutes. The roux will continue to darken to a deep mahogany color. Add the chopped garlic, sage, and ¼ teaspoon of thyme. Stir well and cook for 1 minute more. Stir in the chicken stock, tomato paste, Worcestershire sauce, and hot red pepper sauce. Stirring constantly, bring the sauce to a simmer. Add the spice-coated shrimp or crawfish to the skillet and bring the liquid back to a simmer. Reduce the heat so the sauce bubbles gently. Cover and cook until the shrimp or crawfish are just firm and pink, and are curled, about 10 minutes. Garnish with chopped scallions and parsley. Culinate editor's note: Three pounds of shrimp is a lot of shrimp for this dish. You might instead drop the amount to two pounds or less and replace the missing pound with a full cup of the sliced andouille sausage.